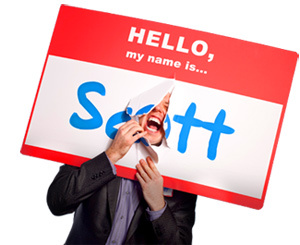 12 Phone Phrases That Payses™ - HELLO, my name is Scott! If you control language, you control thought. If you control thought, you control conversation. If you control conversation, you control outcomes. 1. You don’t know me, but. Be honest. Don’t pretend to be someone’s best friend, especially the gatekeeper. When you call, help someone know right away that you are calling as a stranger who hopes to become a friend. 3. Excuse my annoying typing; I just want to get all this stuff down! Polite, humorous way to subtlety demonstrate active listening while on the phone. 4. Fortunately, I work miracles! When a customer comes to you with a problem, say this immediately. First of all, it’s funny. The humor will diffuse the customer’s anger. Secondly, it’s positive. Lastly, it’s reassuring. 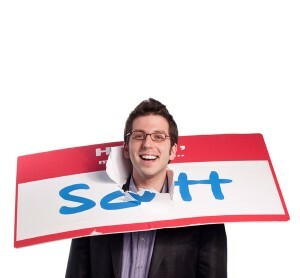 I recently had a problem with a vest from Old Navy. When the customer service rep told me she ‘worked miracles,’ I was immediately excited and confident that she could help me. Interstingly enough, we never found the right size. But I almost didn’t care due to her positive, friendly response. 5. Hang on; I want to write this down. Great in person, greater on the phone (since they can’t see you.) It’s the difference between showing and telling. This phrase lets them know you’re listening, taking notes, and encourages them to offer more detailed answers. 6. I am at your service. Not just for customer service professionals any more, but for everyone! All business professionals are at the service of somebody, be it their customers or coworkers. Say this phrase to reassure your client that you’ve got their back. Remind them that they can ask anything of you. NOTE: especially effective great phrase to use with new customers or coworkers. 7. I think I can help. It’s awfully hard for someone to turn down an offer. However, take caution when adding the word ‘you’ to the end of this sentence. Make sure people know you want to help their situation, not them as a person. They might become defensive if they think YOU think there’s something wrong with them. 8. Right away. Two simple, amazing words. Wow! It shows that people don’t have to wait. They get it now. Few phone operators use this, but when they do, it’s amazing. Way better than ‘as soon as I can,’ ‘as soon as possible’ and ‘immediately.’ Right away. 9. Personally. A single word with amazing power. For example, ‘Mr. Sanders, I will take care of your incorrect order,’ vs. ‘Mr. Sanders, I will PERSONALLY take care of your incorrect order.’ You’ve committed. You’ve made it personal. You’ve instilled confidence in Mr. Sanders that you’re accountable for the mistake, even if it wasn’t your fault. Use this word daily. 10. Say no more! A fantastic response to any customer request. It shows customers that you’ve taken immediate ownership of their needs. It’s fun. And it builds excitement. In fact, it almost makes you sound like you’re about to perform a magic trick! 11. The best way for me to help you right now is. Customers don’t want to hear you say, ‘I’m sorry, there’s nothing I can do,’ they want answers NOW. So, even if you can’t fully solve their problem that very moment, preface your response with this phrase. It demonstrates immediacy and positivity. 12. We can fix that! This tells your customers that you’re solution-oriented and partnering with them for success. (Key word = partnering) Try using this phrase instead of ‘no problem.’ In fact, the word ‘fix’ almost implies that it’s no problem. That you’re on it. ‘Fix’ reduces the severity of the problem, no matter how big. It’s reassuring. REMEMBER: when working on the phone, you must try even harden to project approachability. By using these Phrases That Payses™, you’ll be sure to WOW your callers ever time. What are your best Phrases That Payses™?